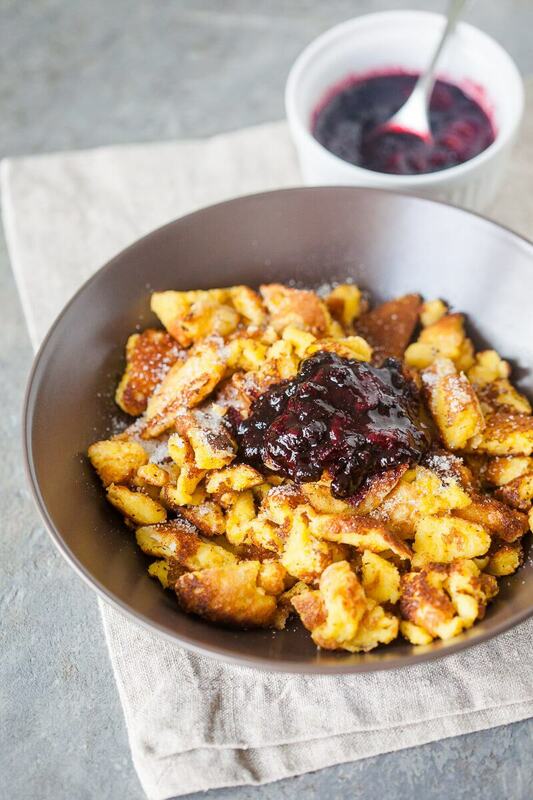 Kaiserschmarrn is a shredded pancake, also known as the Emperor's Meal. It's a breakfast favourite, but we also enjoy it as a dinner. Separate egg yolks and whites into 2 bowls. Add a pinch of salt to the egg whites and whip until firm. Whisk egg yolks by hand, add flour and sugar, then slowly pour in the milk while whisking, to achieve a thick runny batter. Next, fold in a couple of spoons of your whipped egg whitesm mix well, and add the remaining whites by folding it gently into the mixture. Melt butter into a large pan on medium heat, then pour in your batter and cook on medium, until the bottom side of the thick pancake is golden brown, and the top is not runny anymore. Then, with a spatula turn the pancake carefully over and cook for a minute on the other side. Now use your spatula to shred the pancake into smaller bits and pieces, making a mess out the neat pancake, and continue cooking while shredding and stirring, so the bits get all golden brown. Prepare also the berry sauce - place berries in a pan onto medium heat and add a table spoon of sugar. Cook while stirring so the sauce doesn't get burnt. When the berries dissolve and the sauce thickens, remove from heat and set aside. Place the Kaiserschmarrn onto plates, dust with powdered sugar and serve with a berry sauce.